The team at Capital Mind wishes you a very Happy New Year! May your 2015 be filled with joy and prosperity and the kind of stocks we will now talk about. 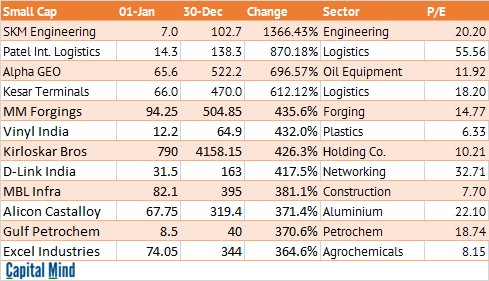 We compare stocks from Jan 1 to December 30, 2014, and here’s the best of the lot. We’ve chosen the top 10, divided by market cap – More than 10,000 cr. are large caps, 1,000 to 10,000 cr. is midcaps, and 100 cr. to 1,000 cr. is the smallcap range. Coming first is the large-cap pack, which sees major representation by Auto, with Eicher andTVS motors hitting it out of the park with a 200%+ return. NBCC sees the best, with a 419% return, and it’s a realty company, in a year when realty went out of whack. Ashok Leyland – a truckmaker that fell a lot to the under-20 levels, recovered smartly this year to 51.5 but it remains below its longer term highs. Bharat Forge – a Capital Mind Premium portfolio stock, as a disclosure – has done very well, going to a 185% return in the year. We didn’t get the whole thing of course. Amara Raja and the battery pack did well too, on the back of falling input prices. HPCL has been hugely helped by the fall in crude prices and the deregulation of petrol. A more secular across the board move was seen in the midcaps. Textiles and Garments players like Indo Count (800%+) and Kitex (500%+) are great. Avanti Feeds has been a stock that’s done well. It’s also one of our biggest mistakes in not sticking with the stock because we thought it was “too volatile” and walked out of it below 600. Serves us right to see it at 1570 now. Gati led the tail end rally of the logistics pack and we saw Global Offshore working well (though it’s pared off at the very end of the year). TVS Srichakra which makes 2- and 3-wheeler tyres has been a great performer. In general, the top 10 stocks gave returns of over 400%! Now wait till you see the small caps. SKM Engineering gave a nearly 15x move from Rs. 7 to Rs. 102! Two logistics companies – Patel Integrated and Kesar terminals were stocks that went up over 600% in 2014. MM Forgings is another Capital Mind Premium stock, and we’ve been able to hold on. Today it closed at Rs. 550, which adds even more to its return. There are very interesting stocks here, like Excel Industries, MBL Infra and Vinyl India which are sub-10 P/E stocks even after giving stellar returns. That was a look-back. But can we predict the best stocks of 2015? Answer: No. If we could, we wouldn’t be writing it in a newsletter. We would just put all our money (and borrow more) into those stocks and wait. The point about stock trading and investing is not to pick the best performers. You will NEVER be able to, and you are incredibly lucky if you get to participate in some of them. The point is to work with discipline. If you want to choose the high performers from the lows to the highs you will just end up disappointed. A better approach would be to wait until they start moving and then follow them. Some will lose steam and hit your stop losses. The few that remain will stay with you for a while. 2015 might see stocks rally a lot, and no matter what the index does, some stocks will give you incredible returns. Like you’ve seen above, a big move doesn’t mean a stock is valued too richly – an Indo Count is still at a sub-10 P/E even if it has moved up 800%. More importantly, the point is really to look out for these stocks. When good stocks move, they will make new highs and continue to make new highs and that gives you the momentum to participate and stay in the game. These stocks need some attention – a stop loss check every once in a while, but it’s not something you need to watch a stock quote all day for. 2015 will bring more opportunities. We don’t know what. But we’ll constantly use the 45 day high filters to find momentum movers and participate. We hope to bring you great performers in the next year, and again, hope it’s a brilliant year for you and your loved ones. Capital Mind Portfolio stocks are available only to Premium subscribers. These are not recommendations; we buy them, and we post when we buy and when we sell. Please do not hesitate to ask us for information at premium@capitalmind.in.